As anyone knows, tuna salad is often thought of as one of the most boring and unadventurous salads that it is possible to make. However a little imagination can go a long way to making the humble tuna salad a much more attractive proposition for those wanting a healthy lunch without too much hassle. half a chopped apple, although this is optional. Tahini is available from many shops and is made with ground sesame seeds, olive oil along with other ingredients. If you are feeling adventurous you can make your own tahini sauce, the instructions on how to make tahini sauce are covered later. Tahini replaces mayonnaise as the salad's emulsifier. Once you have your tahini sauce, put it to one side along with your rinsed chopped vegetables. Then place your drained tuna into a medium bowl and add your prepared vegetables with the required amount of tahini sauce. As noted above, the actual amount of tahini sauce that you decide to add to your tuna salad is a matter of personal taste. After adding all the ingredients mix well until they are all sufficiently blended. 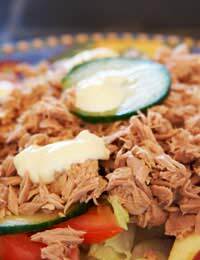 Your tuna and tahini salad is now ready to serve. It is possible to serve your tuna salad either chilled, as a pitta bread filling or on a sandwich accompanied with lettuce,cucumber and tomatoes. Tahini is made from a sesame seed paste and because it is naturally thin it is suitable for use in things such as marinades, pitta sandwiches and dips. Once made, as long as you store it in an airtight container and keep it refrigerated, tahini sauce will keep for around two weeks. a teaspoon of parsley, that you may finely chop if you prefer a tea spoon of low fat yogurt. Using a food processor, or if you prefer a mortar and pestle, mix your garlic and low fat yogurt with the tahini and add salt. After mixing remove the contents and then add the olive oil and lemon juice to the mix. If at this stage the mixture is on the thick side you can add a teaspoon of warm water to make it thinner. The next stage is to mix in the parsley and your tahini sauce is now ready for serving or refrigerating.